Charlottesville, Va., September 23, 2015 – For St. Anne’s-Belfield School sophomore Michelle Liu, summer vacation meant not only the chance to visit with her family and friends in Beijing, China, but also an opportunity to work with giant pandas through programs with Operation Earth, a China-based international field research organization dedicated to biodiversity conservation and global climate change. Liu spent a week with these endangered animals at the Bifengxia (Green Peak Canyon) Panda Center and Hetaoping Wolong Panda Center at the Wolong Nature Reserve. Both centers are located in Sichuan Province and operated by Pandas International. 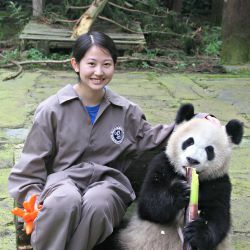 “I got to work with many amazing people who dedicate their life to researching, raising, and helping pandas,” Liu said of her time at the centers, which hold the ultimate goal of sending resident pandas back to nature. For seven days Liu joined international volunteers to clean the pandas’ living environments, cut down bamboo and bamboo shoots for feeding, “cook” special, nutrient-rich cakes to supplement the bamboo diet, and record the behavior of a male panda, a pregnant female panda, and a female panda and her child. A memorable highlight of her experience was climbing a mountain to trace the movement of an adult male panda. “Since the panda is considered a symbol of China and welcome all over the world, I wanted to do something for them,” Liu said about her motivation for the experience. She will continue her work for the Bifengxia and Hetaoping Wolong Centers this fall when she sells t-shirts at St. Anne’s-Belfield School emblazoned with photographs from her week as a volunteer. All proceeds will be given directly to the panda centers.